What life questions do you have that you sense – once you have the answers to, would really make a difference in how you viewed your life / the World / the Universe and your place in it? There are many interviews available on You Tube of Dolores Cannon explaining her findings as a regressionist, she is also an author of many metaphysical books detailing the profound findings and information given by the subconscious of her various clients from all over the world. She established the QHHT™ method over 45 years as a past life regressionist, she is referred to as a reporter of lost knowledge from the ‘Source of All Knowledge’ – The Subconscious. However many people are being given information from their future lives also, there is always free will and choice and this experience offers insight and a renewed perspective and is encouraging. Your deepest knowing is channelled through your session of Quantum Healing Hypnosis Therapy pioneered and founded by Dolores Cannon. I was trained by Dolores herself directly and not over the internet for both the Level 1 and Level 2 Practitioner Trainings and have been facilitating these sessions ever since. 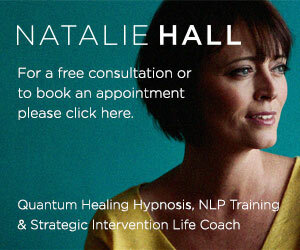 Prior to this I was already an experienced and fully qualified Advanced Hypnotherapist since 2004. I will be happy to hear from you to discuss your own personal and confidential session. Dolores Cannon and the QHHT Practitioners she has personally trained are experiencing an evolution in the work we offer as hypnotherapists. Clients (who are coming from all over the world) are no longer experiencing regressions into past lives. Disclaimer: When visitors leave this website Natalie Hall is not responsible for what you find elsewhere. Thank you. State Management is fantastic when facilitated by a Coach so you can identify how you do what you do when you’re in a resourceful emotional state so you can do it more of the time. Each person is unique so anchoring a really positive experience will be unique to each individual, once achieved this positive anchor can be used time and time again, so you can choose how you want to be and feel in any given situation.